Among the designer wares on the third floor, Habitant serves craft drinks and snacks to thirsty shoppers. A tangled group of girls in black is hovering around Habitant, the new craft cocktail bar in downtown Nordstrom. They’re watching the mustachioed mixologists shake up mescal drinks while unwinding post-workday. There is laughter and loud music — interrupted by an intercom requesting that customer Sue Reed return to the dress department. A grand experiment to loosen up the collar of conservative Nordstrom, Habitant skews about 20 years younger than the rest of the store. There’s Chartreuse and Fernet on the shelves, much like all the hip happy-hour haunts this Nordstrom bar seems to be striving to be. And Daft Punk and Justin Timberlake, not the tinkling pianos, blare into the store. 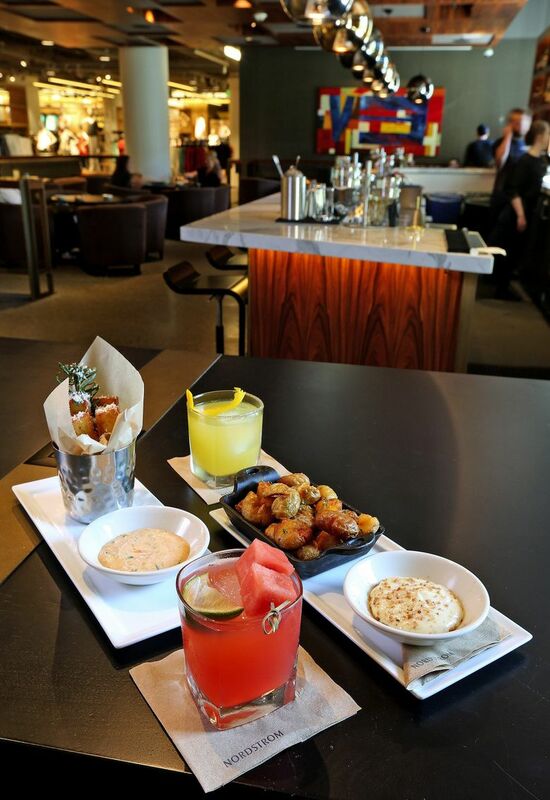 Opened in late April, Habitant Seattle is Nordstrom’s third cocktail bar; the original opened in Bellevue Square in 2013 and another in Puerto Rico in March. In Seattle, it’s plopped down on the third floor of the women’s department, between the contemporary fashion lines Topshop and Rag & Bone, where a redhead sporting a lighthouse of a diamond ring was eyeing a pair of $246 jeans. It may aim to be a sip-and-shop experience, but on a recent afternoon anyway, Habitant looks more like a holding area for folks waiting while their significant others shopped. The food menu is short and simple: a ubiquitous hummus for vegetarians, some nibbles and shared plates. Golden polenta fries come with a dried tomato aioli to mop them up with. Some crazy-addictive bacon aioli comes with crispy potatoes. Those are your best bets, though most opt for the bland chicken tacos (four for $8.25) because they’re cheap and will fortify you between rounds of cocktails, nothing more. Negronis and stirred whiskey drinks headline the beverage list. But its most ambitious offerings were the savory and spicy agave cocktails: a smoky variation of a margarita made with mescal and rimmed with Alderwood smoked sea salt and a tequila-watermelon drink with jalapeño syrup, lime and St. Germaine cordial. Nordstrom’s heralded customer service is put to the test here. It’s a logistical nightmare for the staff. The kitchen sits on the fourth floor, requiring servers to shuttle up and down the escalator and weave through shoppers while balancing trays of food. Tip well. Habitant in Nordstrom, 500 Pine St., opens 11:30 a.m. to 9 p.m. Monday-Saturday and 11:30 a.m.-6 p.m. Sunday with $8-$11 cocktails, $4.50 beers and $10-$25 glass of wines. Bar snacks range from $5.95-$10.75 (206-628-1635 or shop.nordstrom.com).